We all know one. That quiet unassuming person who keeps mainly to themselves. A person who stands alone in the corner in a crowded room, occasionally nods, smiles and waves. They were the student who didn’t speak until spoken to; the good child who was seen but not heard. These quiet kids grew up to be quiet adults, the ones who take jobs that leave them out of the public eye; accountants, computer programmers, and the like. They remain on an even keel, steer the steady course, and would never be seen on the stage at a karaoke bar. These quiet unassuming people would never drive flashy cars; no yellow Vettes screaming down the highway, or bright red Ferraris cruising Miami Beach on a Saturday night. For these folks, there is a German car manufacturer that seems to have just what they want. No, not the Mercedes in all its smugness, or the BMW in all its showy glory; no we refer to the Audi. Sure, the line has its flashy models; the RS, TT, but yet even these can be said to have little in the way of anything approaching any sort of flamboyance. And so it goes with this week’s subject, the 2015 S5, the cabriolet version. The Audi’s S5 coupe debuted in 2007 as a 2008 model. The cabriolet version was introduced the following year. We have driven Audis before, liked them, knew them to be good looking well made cars that have little wow factor yet deliver a good (in the case of the RS5 great) driving experience. So when told we would get the S5 cabriolet for a week, we knew we would not be disappointed. Like many of the Audi models we have tested though, we never really had a “wow” factor with our S5. That’s not a bad thing, not at all, if that’s what you are looking for. The S5 is the sport version of the A5 sedan. The S5 adds such things as larger brakes and a tuned and lowered suspension; inside there are carbon fiber accents, racing style bucket seats and a nice flat bottom steering wheel. 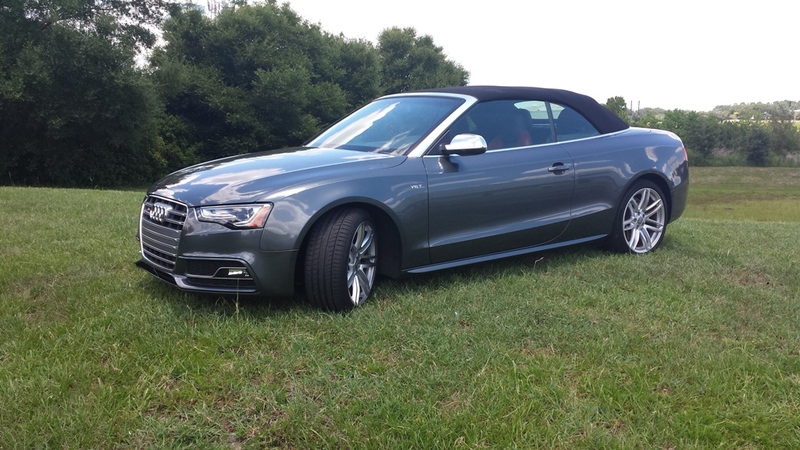 The S5 Cabriolet takes the top down and has two levels, Premium and Premium Plus. The Premium models comes standard with a 10-speaker AM/FM/CD/SiriusXM stereo system with iPod integration (although there is Bluetooth connectivity, only Apple users will find a connection, curiously as in all Audis there is no USB port). The seats feature nice Nappa leather upholstery, the front seats are heated and there is tri-zone automatic climate control, 18-inch alloy wheels, foglights, xenon headlights and LED taillights. The Premium Plus was the model we had for the week. It adds a navigation system with Audi Connect, a 12-speaker, 505-watt Bang & Olufsen sound system with HD ratio technology, Audi side assist and a rear parking Camera. We also had Audi Drive Select, which gives drivers a variety of different suspension, steering, transmission and engine calibrations. You can option out ventilated seats, adaptive cruise control and a performance-oriented Sport Differential package with torque vectoring. This is a convertible and the S5 Cabriolet has something others in its class do not; a lightweight, insulated cloth folding top rather than a heavier, but more coupe-like, folding metal hardtop. 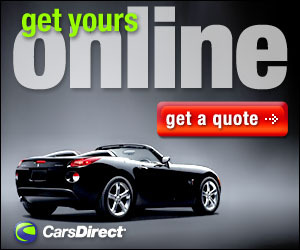 The top can be dropped or lowered at speeds up to 30 miles per hour. Something else that only Audi offers, and was in our model, is in-car internet connectivity and Google Earth integration – complete with panoramic views and high-resolution 3D satellite and aerial imagery. Among the nav systems we’ve tried in, well forever, the Google Earth feature makes for the nicest looking display we have seen. Like other Audis, the exterior look is nice if not simply in its elegance. Audi gave the S5 a mid-cycle update that gave the model headlights that are angled a bit more, a new “singleframe” grill and what Audi says in a more aggressive front fascia. The interior is nicely appointed and like all German cars it seems, filled with an array of buttons, knobs and thingies you might, or might not ever use. The front seats are comfortable, but truth be told the rear seats are a challenge to crawl in and out of, although once there the room isn’t too bad. The engine, which sits behind the front wheels in the engine bay for more stability, is a supercharged V6 with a “T” designation. We never did find out what the “T” actually designates, there is no “T” in supercharger and in German supercharger is “Gebläse”, so maybe “Tubercharger”? No matter with 333-horsepower and 325 ft-lbs. of torque from the seven speed automatic “S-Tronic” transmission one of the best things the S5 does is take to the road. There is plenty of power and the shifts are easily some of the best we have felt in any car. Tuning the Audi Drive Select to the “dynamic” mode will give a bit sportier feel with a pleasing engine sound accentuated by a few nice “pops” from the exhaust notes during aggressive acceleration. For those who want to go even sportier there is a selective shift mode and paddle shifters. We can report only a little about the top down performance. Living in Central Florida and it being June the sun and the outside is not your friend. The red leather seating with the black accents in our model look great but can be downright punishing when the top comes down the sun beams directly down on the interior. Overall however the S5 delivers good performance and a nice ride. The interior may not be as quiet as the coupe but that’s the nature of all convertibles. 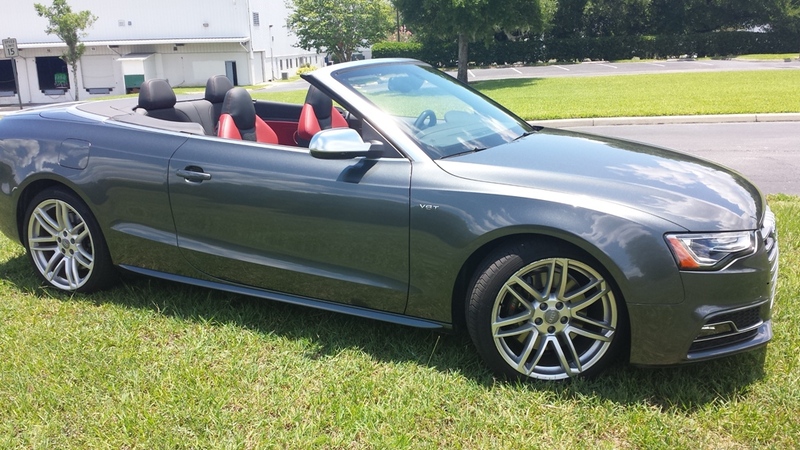 It could use a nice refresh (there has been none since 2007) but for those quiet people looking not to stand out from the crowd while diving a very nice small executive coupe, and who might want to let their hair and top down on occasion, the Audi S5 Cabriolet is a nice choice. Just don’t look for one in the parking lot of the karaoke bar. Zero to 60 mph: 5.3 seconds. Front shoulder room: 54.3 in. Rear head room: 36.3 in. Rear leg room: 31.9 in. Free maintenance: 1 yr./ 5000 mi.